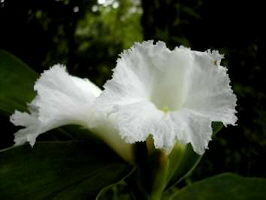 (2mAbcD) Will present you with unusual white flowers that pop out of a large bract at the heads of the plant in summer & autumn. Likes a frostfree climate. In cooler climates they make a good pot speciman and can be taken indoors for winter. Part to full shade. Sent in pots.